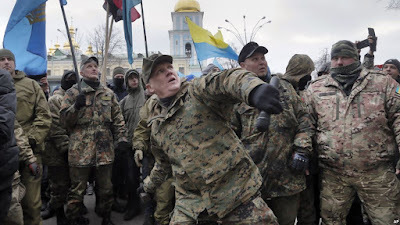 KIEV, Ukraine -- Two years after the Ukraine's Euromaidan, the mass uprising that toppled the Russia-backed regime in 2013 and brought a pro-Western government to power, the country is still battling the corruption that the Euromaidan sought to purge. Mykola Kokhanivsky, commander of a volunteer battalion, throws a stone against the window of an office that belongs to Ukraine tycoon Rinat Akhmetov in Kiev, Feb. 20, 2016. The activists blame Akhmetov for supporting corruption and pro-Russian separatists. Last week, Ukraine's government barely survived a no-confidence vote in parliament, triggered by the resignation of a reformist economic minister over corruption and slow reform. This week, German Foreign Minister Frank-Walter Steinmeier called on Kiev to push forward with reforms "based on a principle of zero tolerance for corruption." The corruption in Ukraine even threatened the International Monetary Fund’s support for the country. "Without a substantial new effort to invigorate governance reforms and fight corruption, it is hard to see how the IMF-supported program can continue and be successful," IMF Managing Director Christine Lagarde said this month. In December, U.S. Vice President Joe Biden called Ukraine's corruption a "cancer" and put the fight against it on par with the war against the "unrelenting aggression of the Kremlin." According to a Gallup poll, only 17 percent of the population approved of President Petro Poroshenko's job performance last winter. More than 80 percent said corruption was widespread in both the government and businesses. Corruption in Ukraine overshadows the progress the new government has made. Anders Aslund, a Ukraine expert with the Atlantic Council think tank in Washington, wrote in January that Ukraine’s economic growth this year could surpass that of Russia. He praised Kiev for carrying out important reforms in the energy and banking sectors, as well as securing the IMF’s support. However, in the same overview, he pointed to the need to make “a credible fight against corruption,” starting with reform of the general prosecutor's office and the court system. "Ukraine has 18,000 prosecutors and 10,000 judges. All but a few of them are likely to be corrupt," Aslund had written in an earlier article. Joshua Cohen, a former U.S. Agency for International Development project officer involved in managing economic reform projects in the former Soviet Union, called on Ukraine's leaders to outsource the fight against corruption. He cited the successful example of Guatemala's independent International Commission Against Impunity in Guatemala (CCIG), created in 2006 after decades of civil war, when the country acknowledged its own inability to rein in corruption. "CCIG was immune to pressure from the government or the oligarchs or security services," Cohen told VOA Ukrainian. According to Cohen, Ukraine's corrupt "old guard," including the office of the prosecutor general, are the greatest allies to Russian President Vladimir Putin in his fight against Ukraine. Doubts about Poroshenko's commitment to change persist. He was ranked Ukraine's sixth-richest man in 2015 by the Novoe Vremia newspaper, with an estimated worth of $979 million. He was also the only person in the top 10 whose net worth had increased since 2014 (by 20 percent). "We won't have a clear answer to that question [whether Poroshenko's policies are affected by his interests as a businessman] until after he has left office," Alexander Clarkson, lecturer in German and European studies at King's College London, tweeted to VOA Ukrainian. Adrian Karatnycky, nonresident senior fellow at the Atlantic Council, called for a cautious approach to fighting corruption in Ukraine. He wrote in The Wall Street Journal that oligarchs control a sizable portion of Ukraine's economy and parliament, and pushing them too hard would lead to a collapse of both the economy and the coalition government. Mikheil Saakashvili, former president of Georgia and the current governor of Ukraine's Odessa region, has been at the forefront of Ukraine's push against corruption. He enjoys support from Ukrainians for his relentless verbal attacks on the country's top officials. But Saakashvili's success in fighting corruption has been limited — something his opponents do not fail to mention. Former U.S. Ambassador to Ukraine John Herbst argued in an interview with VOA’s Georgian service that Saakashvili has been thwarted by Ukrainian Prime Minister Arseniy Yatsenyuk, who stripped the former Georgian president of essential powers. The National Anti-Corruption Bureau (NABU), one of Ukraine's three anti-corruption bodies, made a much-publicized effort with the arrest in February of a state prosecutor who had allegedly attempted to buy himself a job in the agency with a $10,000 bribe. "Any attempts to bribe members of commissions reviewing candidates for positions in the bureau will be met with a harsh reaction, such as the one you've witnessed in this case," NABU head Artem Sytnyk said of the arrest, which was subsequently dismissed by Ukrainians online as a publicity stunt. Mistrust of the government runs deep, and reversing it will require real change on the part of the government, said Maxim Eristavi, a Ukrainian journalist with a following among Western experts and the media. Still, Eristavi sees grounds for optimism. "The transparent way we debate this crisis, a number of brave reformists, a vibrant civil society — all this wouldn't be possible in Ukraine just three years ago," Eristavi said.